It’s been 3 years since freefliers from around the world gathered together to hold hands and create the 108-Way Vertical World Record back in 2009. So this year it was time to see what we could do. 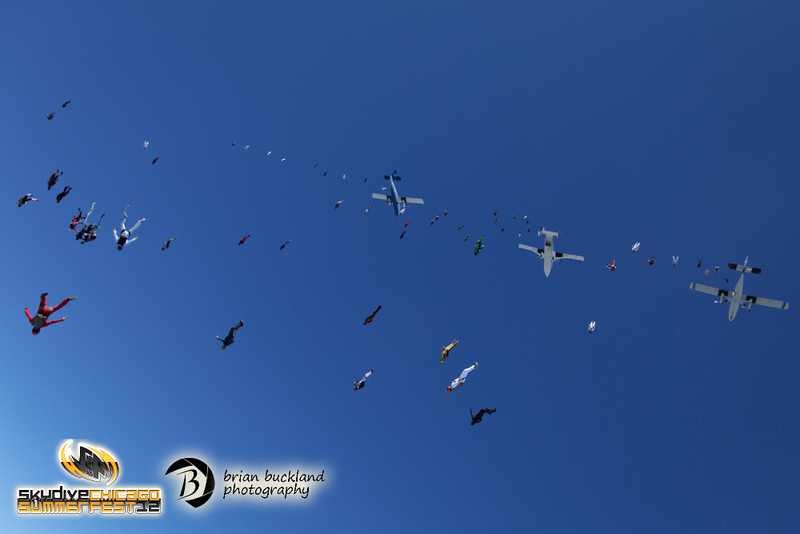 With 6 planes, 142 skydivers and a bench FULL of jumpers just itching to get on, we set out on August 1, 2012 at Skydive Chicago to smash the old record. 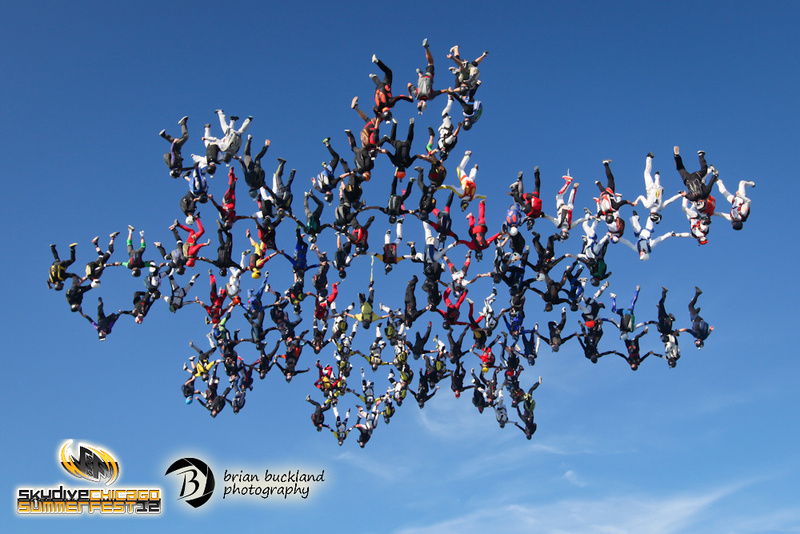 On Day 1 of the event (that was happening during Skydive Chicago’s annual Summerfest Boogie) we started off by building formations with over 130 jumpers linked up. Since we were trying something completely new, we decided to try exits that we had never tried before. The lead plane (a sherpa) put out a super floater. When that floater exited, so did the back 3 aircraft. 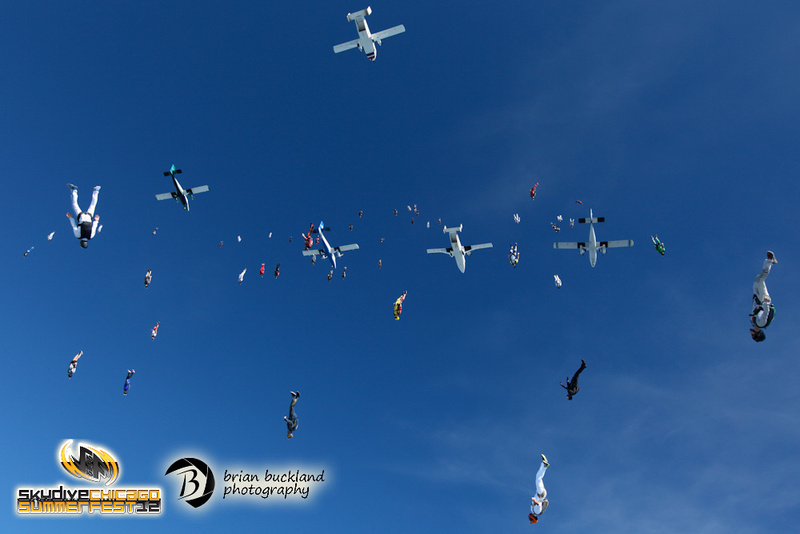 As the last jumpers were exiting the back 3 planes, the front 3 planes began to exit. The idea was to have the back 3 planes worth of jumpers Float Up to the formation, while the front 3 planes worth would Dive Down. Day 1 was a good day. We got in some amazing jumps, learned a lot about over floating and blowing past the formation and by the end of that day, most of the kinks were ironed out. Day 2. The day started out great. The clouds rolled in for a few jumps, but were high enough that they only made the camera fliers sad to be shooting into a large white backdrop. The formations were taking shape and we were getting to the point where everyone on the skydive was docking on the formation, just not at the same time. That is until the 5th jump of the day. That’s when the magic happened. We built a beautiful 142-Way formation. Everyone was on. It looked good. We landed, the photographers pulled up the pictures and scrutinized the images. It still looked good. Time to submit to the judges. Within just a few minutes, the judges were calling us over. They started asking me questions and I simply called over and deferred to Rook. All the organizers and the judges chatted for what seemed like an eternity and then the news. There was no 142-Way. 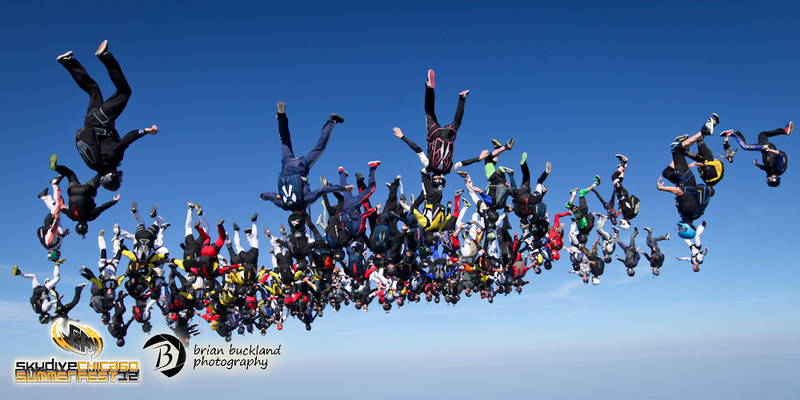 When attempting an official World Record Skydive, the organizers of the jump must declare the exact formation that they are intending to build. They draw it out on paper and submit it to the judges prior to taking off. Then, if the formation completes and is judge-able, the judges compare the drawing to the picture or video and declare a record or not. In the rush that happens at events like this, minor details were over looked and the formation that was submitted had 2 stingers with incorrect grips. It was a huge blow. The 142-Way formation that was indeed complete, and might count in the Guinness Books, would not be an FAI official World Record. The only thing left to do was to keep the energy up and move forward, and that meant more jumps. Day 3. With all of the paperwork now in order, the entire group was striving to recapture that magic moment of the 142-Way. Several jumps were going on and the energy was good, but starting to fade. Many times there was just 1 jumper off and as they got on, break off was happening. The group was starting to get frustrated, but the jumps were still amazing and nearly everyone was so close to re-creating that record to make it official. It was getting towards the end of the day and the organizers were going to have to do what they had been avoiding all along. Cut down the jump from 142 to 138. One of the pods that was causing issues just had to go. This was going to be the 15th jump of the attempts and people were getting tired. It was going to be one of the last jumps of the day and the next day was our last day to go for a record. It was now or never. With 138 skydivers (16 of which were women) from 17 nations and 4 cameramen we boarded 6 aircraft and headed to 18,500 feet. Break off was 7,000 feet. We went up and did what we had to do. When that last jumper picked up their grips, everything smoothed out. You could feel it, see it, sense it. It was flying as smooth as the organizers had hoped it would. There were no stragglers on the outside, just cameramen trying to get that nice angle and take as many pictures as possible, since after all, this is what we are here for. It flew for nearly 4 seconds, but that seems like an eternity at 165 m.p.h. The end result was this shot of the Official Vertical World Record 138-Way. 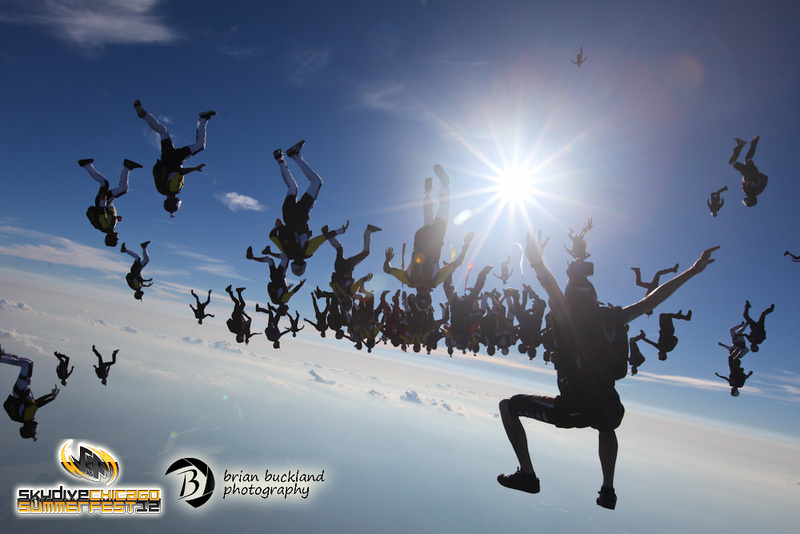 Congratulations to all 138 Skydivers on this record! It was an amazing experience and I can’t wait for the next one. The OFFICIAL VERTICAL WORLD RECORD DVD is now available. English Jon and Brian Buckland are putting together the DVD and stepping it up a notch this year. It will be a 25-30 minute long feature with multiple outside angles and inside angles as well as a lot of ground footage, interviews, bonus material, etc… Please visit verticalrecord.com to place your order.